The latest IAEA report on Iran’s nuclear program is a particularly bad piece of news for an Obama administration that is already coping with other brushfires in the Middle East. 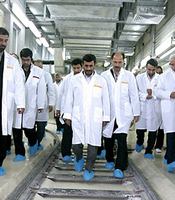 If President Barack Obama is re-elected next year, then Iran will very likely cross the nuclear finish line on his watch. Given the “musical chairs” nature of U.S. politics, where the person left standing when the music stops loses, the blame for Tehran getting the bomb will fall squarely on Obama’s shoulders, even though one could quite fairly apportion a fair share to the Clinton and Bush administrations.